A few months ago, at my magazine’s annual reader get-together in Livermore, California, a small squad of electric-powered Zero motorcycles silently arrived to fill that manufacturer’s booth at the event. One of them was a fetching green color, but even more remarkable was that it was there at all—it had been ridden from San Jose, 34 miles away on bumpy, twisty Highway 130, over a 4300-foot mountain. There was nowhere to plug the bikes in, and when the event was over, the jolly crew of Zero employees once again whispered away to meet the chase truck in San Jose. That’s not supposed to be possible on electric motorcycles, even with the 2012 model’s impressive 120-mile range. Well, now we know how they did it. 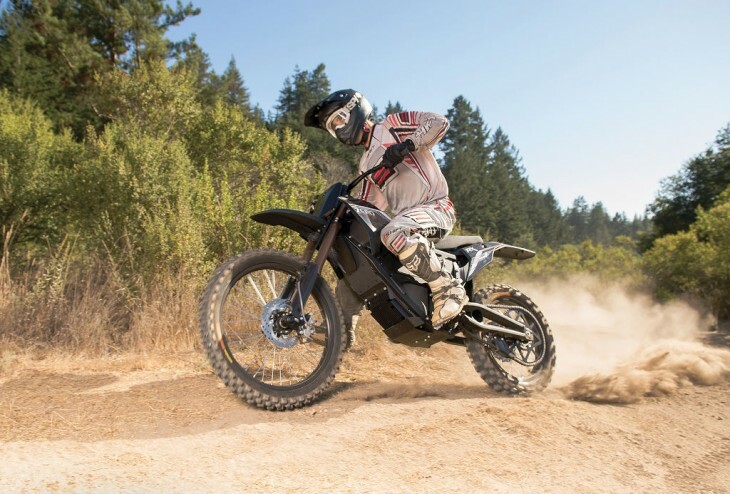 Zero announced the 2013 range of street and off-road motorcycles, with more range, faster recharge capability and most importantly to us gear-heads, a lot more power. 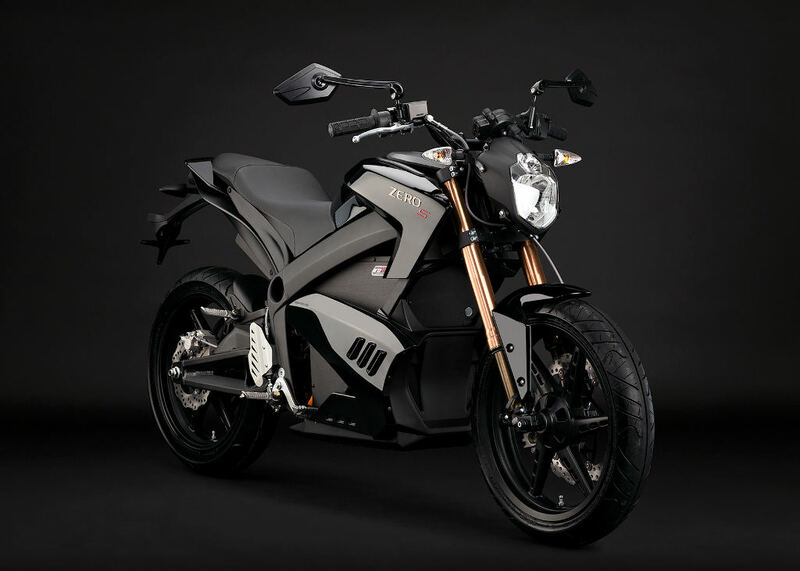 For the S (standard) and DS (dual-sport) models, Zero introduces a “Z-Force” motor, the first motor the company has designed from the ground up for use in a motorcycle. It’s air-cooled, requires no maintenance, lets you tell people it has a radial-flux permanent magnet, and makes (drum roll, please) 54 horsepower and 68 ft.-lbs. of torque—yowza. Top speed is 95 mph (probably limited somehow), but I’ll bet you get to 95 in a hurry. Juice is provided by an improved Z-Force battery, and buyers can select two different 102-volt power packs. An 8.5 kilowatt hour pack nets you 103 miles of city riding, 53 miles at a steady 70 mph, or 79 miles combined. If you pony up for the 11.4 kilowatt-hour box, you’ll go 137 miles in the EPA UDDS city cycle, 70 miles at 70 mph, or 93 miles combined. Home charging time is reduced 25 percent to 6 or 8 hours (for the big battery), but you can now purchase an adapter to use public CHAdeMO quick-charge stations, which can bring a flat battery to a 95-percent charge in an hour. Battery-pack life is estimated to 343,000 miles for the 11.4 kw-hr. The chassis, electronics and other equipment get improvements, too. The frame is new, with passenger accomdations now standard, the swingarm is stiffer, the motor is a stressed member, and brake calipers are now made by Nissin. Curb weight is a claimed 350 or 382 pounds. The DS is similarly upgraded, but with slightly different weights and top speed, plus it now uses a 19-inch front tire. New bodywork makes the bikes look more motorcycle-y, and the “tank” is now a locking storage box. A smart-phone mount is included so riders can log in with an app to monitor detailed state-of-charge and real-time power-usage info. What doesn’t really change is the price—last year’s 9-kilowatt hour S ZF9 was $13,995, and the 2013 8.5 (which offers a little less range but a lot more power and speed) is the same. The 11.4 is an additional $2000. Zero wasn’t through surprising the journalists at the Cologne, Germany INTERMOT show where the new models were announced. An all-new model, the FX, was also rolled out. They call it a “stealth fighter,” a street-legal urban dual-sport that’s the most powerful e-moto Zero has yet to offer. With 44 hp and 70-ft.-lbs of torque propelling a claimed 275 pounds (that’s the 5.7-kw-hr. version, the 2.8 is 233), it should be able to get out of its way in a hurry. The good news is the basic 2.8 kw-hr version is expandable to 5.7 with the addition of a second battery pack—and the packs can be easily removed to recharge, replace—or just keep safe from thieves. The FX seems based on the milder (27 hp and 42 ft.-lbs of torque) $7995 XU model, intended to be popular with short-distance urban riders, with 18-inch wheels and long-travel suspension. Base price is $9495, add $2495 for the second battery pack. There are more changes in the off-road lineup, with a more powerful motor, better components and better range for the motocrossing, 85-mph $9495 MX. Does your motocrosser offer 68 ft.-lbs of torque? And if it does, can you ride it on a golf course at 3:00 am? With this lineup, Zero is sending a serious warning shot across the bows of Brammo. These new models offer impressive range, performance and looks at competitive prices. We think our next e-moto comparison will be much more interesting. Gearing has nothing to do with an electric motor as it is not applicable it behaves in a different manner to combustion engines which need a lower gear to start up then progress through the gears. With an electric motor there are different dynamics involved. There is an immediate torque. Just look at the white zombie lightning to know what I’m talking about. In the world of electrics it is a whole new world and should be treated different in its own perspective. If you think about an electric diesel locomotion. It can pull many carriages it is only one speed (I think) Yet the massive power. Imagine how big combustion engine you need to do similar. This is the great thing about electric motorcycles. It is early days and already we are seeing these performances. And more the life of the electric motor will last many more miles kilometres than a combustion motor. Sorry USA, the EPA will limit EMF emissions to your groins. Expect a 1/4″ lead shield under seat, etc. Not to put too much emphasis on the torque topic, but I don’t think my past bikes could start in 6th gear where they are capable of doing 70mph. The e-bikes can. I envision my crf230 trying to pull 6th gear from a stop. I think the crf230 has a slower top speed than a zero FX also. There has to be a difference somewhere. e-bike looks as if it can pull my crf230 6th gear from a stop, but the crf230 can’t. Similar size and weight bikes. Maybe the clutch comes into play here too, because once up to speed the crf can push itself in 6th. So the crf must have the torque, because it goes in 6th. It just needs help getting there in the first place. Anyone gonna stick supermoto rubber on one of these? Only problem is there are no CHAdeMO quick-charge stations in the North or South East of the USA. There is no useful place to measure engine torque – because it’s a meaningless variable. Yes, it’s only what happens at the rear wheel that counts. But you can get any torque number you want at the rear wheel, it just a matter of gearing. You want a 1000ft/lb, no problem. Well actually there is a little problem, you’ll have a top speed of 0.1mph. The thing that DOESN’T depend on gearing, and therefore is meaningful, horsepower. Power is the product of speed and force. Going to a lower gear gives you more force (torque) but less speed, because the horsepower doesn’t depend on gearing. Torque is just a marketing number. I think the most interesting part of this is the swappable batteries bit. That sort of thinking goes a long way toward addressing concerns regarding limited range and long recharge times. Oh, and to answer the question “Does your motocrosser offer 68 ft.-lbs of torque?”; looking back at the original spec of my ’97 KLX300R and considering its gear ratios, that bike had a max 529.2 ft-lb of torque at the rear wheel (not considering drive train losses). I’ll have to look up what the specs are for my ’72 RT2. It’s pretty useless to measure torque at the engine. It’s the only useful place to measure it. A torque measurement at the engine expresses what the ultimate potential of the vehicle is. Gear ratios are an adjustment and a variable. Well then, I can pump out around 150 ft-lb of torque on my bicycle at the crank. If that expresses what the ultimate potential of my bicycle is then I should be able to blow away pretty much every motorcycle on the planet. Torque at the rear wheel can be converted to thrust (considering the rolling radius of the tire). Add the rate of wheel revolutions into the equation and you can figure out how much power you have. We commonly refer to greater or lesser amounts of overall power as “horsepower”. Horsepower is the only measurement that expresses what the ultimate potential of a vehicle is (excuse the use of a preposition to end a sentence…). As a matter of fact there is nothing wrong with ending a sentence with a preposition – it’s just a myth that really, really needs to go away. Finally some news on the electric offroad side of things. The FX and MX offroad models look nice. True the price is high, but the e-bike gives me a reason to make a little trail system around my house because these things are quiet. Thats always been a dream of mine to have a decent place to ride from my house. With land prices so high around here, it is much cheaper to buy a quiet bike then extra land as a noise buffer. So the offroad around the yard concept is looking better. There aren’t many gas powered bikes that meet that criteria. The Ducati Monster 696 comes to mind. This is the future whether you like it or not. Hmmmmmmmmm…..
No mention if these bikes have regenerative braking. That (or a CVT to keep the motor at peak torque) might extend the mileage even further. The best part was blowing by the group of Zeros on my old ’70’s enduro with knobbies. Those guys were going slooooow. Still, the green bike was really cool. With a 28 mile commute and a riding path for “quck rides” that is just at 90 miles it seems that it may begin to present itself as a viable alternative. Yes, this is finally a viable option for the freeway commuter in CA. Our enlightened gov’t should heavily subsidize electric motorcycles! You mean CA’s heavily taxed citizens should subsidize them. Heavily taxed citizens already subsidize oil in a HUGE way. It’s only fair that alternative technologies get some subsidies as well. Ben, there are big subsidies at federal (10% purchase price tax credit) and state levels and I’m all in favor of them. Vehicles like these reduce pollution, congestion, road maintenance costs, gasoline costs (through lower demand), and oil imports. It’s just common sense to give people an economic incentive to buy zero-emission, electric vehicles. They are not zero-emission vehicles (see above), unless you happen to live in Boulder City, Nevada (which gets ALL of it’s power from Hoover Dam), and even then you have the disposal issue of the battery pack. Last, people already have an economic incentive to purchase them. Lower fuel costs and lower maintenance costs. Subsidizing them simply distorts the true economic cost. (Recommend you read Basic Economics by Thomas Sowell). These are starting to look viable (although the quick charger availability is problematic). IF I had 2-3 times the income I have, I’d probably get one. Electrical power generation is much more efficient than petrol engine efficiency even with line losses. Petrol engines only recover about 26% of the energy value of the fuel. Power stations run at more like 85% so electric are reducing CO2 emmissions and pollution. As power stations change over to renewables or if you install solar panels at home, the reductions will increase accordingly. Gas prices will never trend at anything but going up. Subsizing these vehicles is simply a way or artificially increasing the speed of transition to renewables. What could be the true economic cost if we don’t get serious about making the transition? They do indeed reduce pollution as natural gas power generation is far cleaner than any currently available ICE motorcycle engine. Especially one that has incorporated a modified exhaust system. It is illegal to import coal powered electricity into California so that isn’t likely here. I can generate(and currently do) electricity form the sun and so charging is essentially pollution free. As far as batteries, the materials would be recycled. Lead acid batteries contain far more hazardous materials than Li-O and the recycle program for them are very effective. My concern is can I install GIVI saddlebags and boots so I can carry my tools and ladder as I currently do on my DL650? You may need to invest in a trailer? I have seen another make of e motorcycle that could meet your requirements. What you could do is pose your question to your favourite e motorbike rep.
Electric motors can operate at 90% efficiency, while internal combustion engines are typically 25-40%. There is a significant saving in shifting pollution from the tail pipe to the power plant, no matter the source. Easy to look up. Wow! I’m blown away by these bikes. I spent the first 52 years of my life in northern California, including summers in beautiful Santa Cruz at my dear aunt/uncle’s getaway cottage close to The Boardwalk. Since moving to a not-to-far away state I’m quite familiar with differences in the ways different states operate, and the ways such difference affect consumer prices. The way CA as a state operates causes huge increase in business cost compared to other states. I have first hand experience in this area, including personal relationships with owners of small businesses in CA, and the headwind struggles of such ownership. Which leads to the following complaint about Zero. I’m of the firm conviction that Zero’s costs would be far lower in many states other than the one in which they choose to do business. Such savings could be passed along to consumers in the form of lower prices, making their business model grow that much faster, more assuredly, more efficiently, and benefiting consumers too. I’m sure Zero has personal and business reasons to be in CA. I know personally the geography and the climate. I’m just saying that overall, it appears inescapable that Zero’s choice cost consumers considerably more in final product cost, and that’s a negative that’s hard to deny. I’d italicize “considerably” if I could. So why are these bikes cheaper than similar Brammo models which are built in Oregon? Interesting point, but Tesla, too, set up operation on the other side of the Bay. If you expected to be flamed then you must have known that your point is ridiculous. Should we boot all national and international commercial enterprises from California because it’s not “fair” to consumers for them to pass on the costs of doing business? In this country, a business can choose to operate wherever it wishes; if it fails due to an inability to manage the cost of doing business, so be it. Why don’t you go open up an electric motorcycle business in Nevada and reap the benefits of your huge competitive advantage? Either you don’t know anything about business or you have some political agenda. Buh-bye. Measured by GDP California is about the eighth largest economy in the world. CA currently runs an unknown and unknowable annual deficit (the technology State uses accounting techniques that would be illegal in private industry) estimated to be about $20 billion dollars. The real-life definition of default is borrowing money to pay off debt. Four major cities declared bankruptcy in CA lately. A state with similar accounting problems (I call these problems, others say “so what”) is Illinois. The Governor of Illinois came right out and said they’ll just send all their bills to the Feds later, that would be every American reading this now, and also unborn Americans. Yes, call me silly! I’m offended by happy faces painted on obvious illegal corruption from top to bottom. My political agenda is anti-lying and anti-corruption. I predicted I’d be flames because it’s much easier for Californians to live in a fantasy land than to hear the truth. I still visit The Golden State. It’s interesting to note the condition of I-80 heading west from Nevada. In Nevada I-80 is tolerably smooth. The minute you cross into CA I-80 ruts and pot holes appear in countless numbers. Another hidden tax on CA dwellers is money for car service problems caused by horrific road conditions. As a “green” enterprise, Zero is almost certain to be getting preferential tax treatment and the like from the state and possibly even local gov’ts. Additionally, the combination of skilled engineers and the like that they need are more likely to be found in Cali. So there are compelling reasons to be there. Whether or not those reasons outweigh the costs isn’t our call, it’s Zero’s owners’ call. That is getting very practical. With a 45 mile round trip commute that costs me about a gallon of gas per, that’s $4 a day of gas not spent, and I could charge it at my employer, saving me around $80 a month (presuming I drove a few days a month as I do now). While that won’t make up all the cost difference, it does make up some of it. I may just be a zero customer, about the only thing holding me back is wondering what’s coming out next year. Electric bikes are getting very, very interesting. It looks like an awesome city bike. I suppose if you’re a Sunday rider you might want more range, but for anyone who uses a bike for transportation and rides every day this seems perfectly functional! The problem with funtionality is that it has a ceiling: Going up the price scale, pretty early on there comes a point where you have ALL functionality you can possibly have… above that, you are basically paying for aesthetics, image and other intangible things that are in no way neccessary for effective commute. The problem with electric bikes is that they might be now as functional as $5,000 conventional bike or scooter, but they still cost 3 times as much. they get the prices down and they will, these things will be a huge option! I’d use one now if I could afford it. I got sold on electric bikes when we built an electric mini-bike in 1970 or so at AEE Choppers. Just a battery, starter motor out of a big block, some chain and a push button. That SOB could fly! Yea baby! 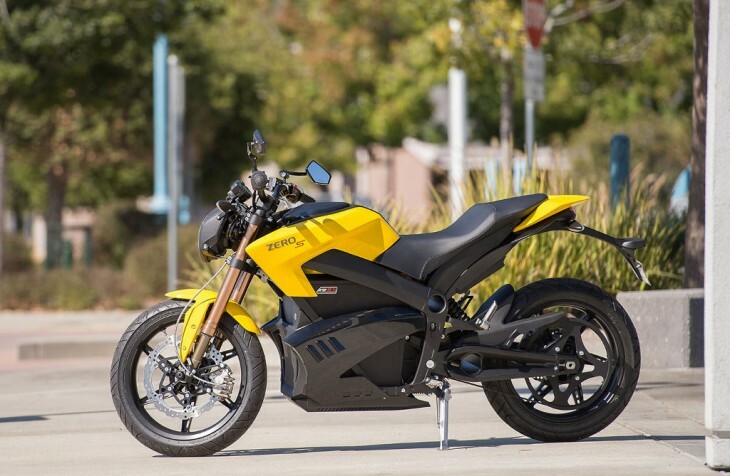 This electric motorcycle and car stuff is getting real interesting. I’m still hoping though that the retail prices can drop some, still expensive enough to stifle purchases and demand in my opinion.